There are five people sleeping rough on the streets of Calderdale, official figures show. Charity Crisis has urged the Government to do more to tackle the root causes of homelessness, calling the scale of rough sleeping a "damning reflection on our society". 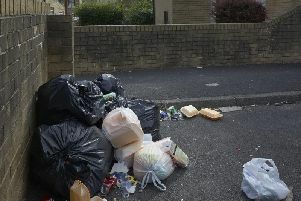 The council estimated that five people were sleeping on the streets in Calderdale during a spot check on one night last autumn, according to data from the Ministry of Housing, Communities and Local Government. This was a decrease from the previous year when six rough sleepers were counted, but is still 67 per cent higher than in 2010. Calderdale has a rate of one rough sleepers for every 1,000 households, which is lower than the national average. Housing charity Shelter blamed a lack of social housing, spiralling rents, and a "faulty" benefits system for the dramatic rise in the number of rough sleepers. Chief executive Polly Neate said: "We welcome many of the things that the Government has been doing to seek to improve services for rough sleepers, but without fundamental action to tackle the root causes of homelessness these measures will only achieve so much." In Calderdale, all of the rough sleepers recorded last autumn were male. Of those who had their age recorded, the majority were 26 or over, but one of them was aged 25 and under. He said: "These snapshot statistics may show a slight decrease in the number of people rough sleeping, but these figures are only the tip of a much larger iceberg." The Local Government Association, which represents councils, has warned that preventing rough sleeping is "becoming increasingly difficult", citing a funding gap of more than £100 million for homelessness services in 2019-20. "The number of vulnerable people sleeping on our streets has now fallen for the first time in eight years," he said. "But while these figures are undoubtedly a step in the right direction, I do not underestimate the task ahead in achieving our ambition of eliminating rough sleeping altogether by 2027."